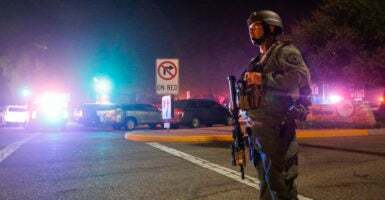 At least 13 people, including a police officer and the suspected gunman, were shot and killed in a Southern California bar Wednesday night, according to authorities. Police are reporting at least 10 other injuries in addition to the 13 killed in the bar about 40 miles northwest of Los Angeles. The suspected gunman was found dead. “It’s a horrific scene in there, there is blood everywhere and the suspect is part of that, and I didn’t want to get that close and disturb the scene and possibly disturb the investigation,” Ventura County Sheriff Geoff Dean said, according to CNN. Sgt. Ron Helus was one of the first law enforcement officers on the scene. He was shot and died early Thursday morning in the hospital, according to the Ventura County Sheriff’s Department. Borderline Bar & Grill in Thousand Oaks hosts “College Country Night” every Wednesday, which draws hundreds of people, according to The Associated Press. Emma Colton is a senior editor at The Daily Caller Foundation.